What are the top landmarks in Capri Island? We loved our stay at Villa Silia! The property was beautiful and in an excellent location. Fabio our host was wonderful and extremely helpful in every way. GG made every meal wonderfully and was very helpful and gracious as well. 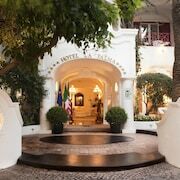 We hope to return to Capri again and would definitely hope to stay at Villa Silia. I can’t say enough about how lovely the villa is as well as everything that comes with it. Beds were comfortable, very clean throughout, no issues at all. Breakfast every morning was excellent. Why anyone would choose to stay in an ordinary hotel when you can stay in one of the many beautiful villas on Capri I just don’t understand. Don’t hesitate to book this property for your time in Capri! Everything was so enjoyable and we were so sad when our vacation ended. The island of Capri is captivating with so many great things to do and see. 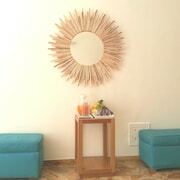 Our stay at Villa Silia made our vacation even more wonderful! Thank you Luigi for sharing your villa with us! Did I say how great Fabio is???? 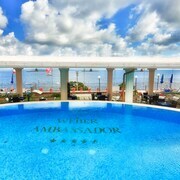 Excellent stay!!! With its rugged sun-drenched coastline and seemingly endless views of the Gulf of Naples, the island of Capri is capable of enchanting any visitor. Whether you have come to spend lazy days at the hotel pool or are hoping to fulfil your need for adventure, Capri has plenty of things to do. Take a luxury yacht out to sea and tan on the decks. Ponder the meaning of life at Anacapri’s serene Philosophical Park. Or hike to the ancient ruins of Villa Damecuta. If you are planning a visit to Capri Island, you have two main options. You could stay on Capri Island itself or book a resort on the Italian mainland and use the ferry to reach the island for daytrips. All ferries from the mainland arrive in the marina near Capri town, and as such, the town is an especially vibrant place with great opportunities for people watching. Staying in Capri will mean you are just steps away from some of the island’s best designer shops, most glamorous bars and swankiest restaurants. 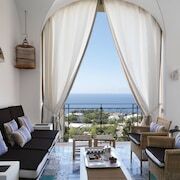 For a quieter experience, look for resorts on the coast or in the slightly more low-key town of Anacapri. 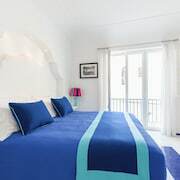 If you’re on a budget or would like to experience the daily ferry trip through the gulf’s waters, the nearby mainland coastal towns of Naples and Sorrento offer modern hotels with swimming pools and dining options at reasonable prices. Be sure to have your camera ready at all times, as Capri has some of the region’s best sightseeing. Wander around Villa San Michele, a museum built on the site of an ancient Roman villa, offering panoramic views of the Bay of Naples. You can also take a short uphill climb to Villa Jovis, the ruins of the home of Roman Emperor Tiberius. This is the largest and best preserved villa built by the extravagant Tiberius, and once here, you’ll quickly discover why the emperor chose this stunning location for it. It’s worth setting aside some time to explore the waters off the coast of Capri. Hire a traditional gozzo caprese boat and spend the day out at sea. Your skipper will take the helm, leaving you to relax and enjoy a leisurely sail around the coast. Don’t miss a trip to the Blue Grotto, a natural sea cave filled with a water whose vivid shade of blue is caused by the sunlight entering the opening under the cave’s mouth. There is no better place to enjoy Italian cuisine than sitting on a sun-drenched deck watching the world go by. Treat yourself to a gourmet dinner of island seafood specialties under the stars, or head to a rustic pizzeria for a delicious lunch. Stop at a local market to source a picnic of sliced meats and cheese to enjoy during a day of hiking and sightseeing. Explore Capri Island with Expedia's Travel Guides to find the best flights, cars, holiday packages and more!